From the author of Dungeons & Drag Queens comes a fierce bizarro tale of dinosaur-riding realness. Ivanna Deflower’s chance at drag superstardom passed her by long ago. She has resigned herself to a normal life raising her son with her ex-wife while occasionally hosting Sunday morning drag queen bingo. And she’s fine with that. She really is. 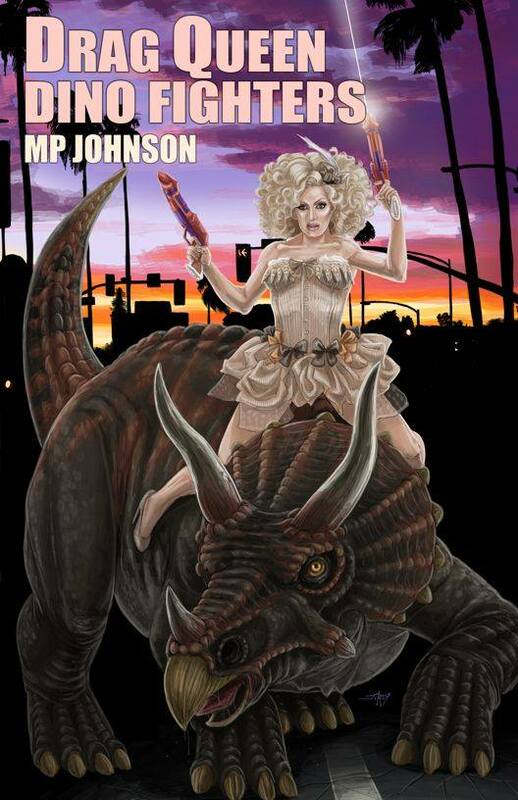 Until her life is turned upside down by the one thing that’s guaranteed to give a past-her-prime drag queen another shot at the big time: a baby triceratops that can out-dance even the youngest and most sickening divas in Los Angeles. But the climb to the top isn’t going to be easy. Not only does she have to contend with her shade-throwing former friends, there’s a certain big game-hunting drag king with a vendetta and access to cybernetic technology. And what about all those bright lights in the sky and the shaking ground? Even if she can sashay around all of these obstacles, what is she going to do about her own family? Come on, seriously, how can you look at that cover and not feel a burning desire to read this? I've been both a fan and a friend of MP's for a few years now, and I am ridiculously excited for more bizarro drag queen adventure. I have to take my bizarro in small doses, lol. But yes, the cover is grabbing my attention, and if nothing else, I'm dying of curiosity!